Put you and your data ahead of the pack with this new out-front bike mount from VELOCHAMPION. This durable mount which is made from impact resistant plastic, allows you to make the most of your Garmin computer whilst on the bike. The mount is out in front of you for easier, heads-up positioning and increased safety. This is a great value Mount and a worthwhile investment. Easy to install. The GoPro adaptor is a separate product available to buy in the VELOCHAMPION range. WEIGHT: 26 grams (0.9 ounces). DIMENSIONS: 113mm x 52mm x 39mm (4.5in x 2in x 1.5in). Please ensure your Garmin computer is fully insured before using this mount on your bike. Maxgear Limited does not accept liability for stolen or damaged phones whilst using this product. NOTE: You will only receive the Mount. The Garmin Computer is not included. OUT FRONT MOUNT: This compact bike handlebar mount from VELOCHAMPION allows you to place your Garmin Edge cycling computer in front of your handlebars. This means your computer is in a position optimised for easier viewing and increased safety. You can also video your rides/commutes at the same time with the 2-in-1 Garmin plus GoPro mounting system (additional adaptor required to fix your existing GoPro mount underneath). FULLY SECURE: The quarter turn locking system ensures the Mount and Computer stay in place during your ride. This stylish mount allows you to take full advantage of all the robust data that the Garmin Edge provides, without compromising your ride. 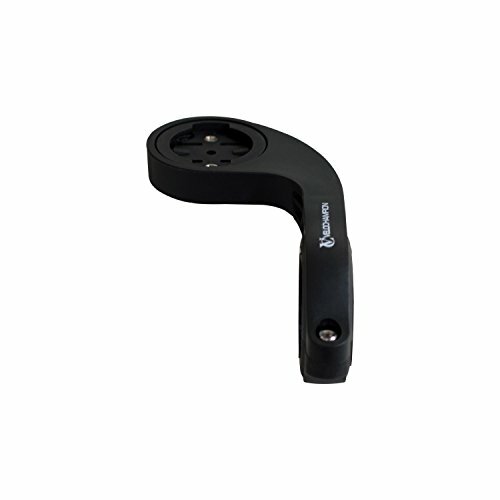 COMPATIBILITY: This Mount is fully Compatible with all Garmin Edge cycling computers except the Edge 1000. There is a separate Mount in the VELOCHAMPION range which fits the Edge 1000. The Mount is compatible with either Standard or Oversize handlebars. MULTIPLE USES: Ideal for use on road, triathlon, mountain (MTB), hybrid or commuter bikes. CONTENTS: The Package Contents include 1 x Garmin Edge Mount and 2 x rubber spacers for different diameter handlebars. Easy to install with a 3mm hex (allen) key. If you have any questions about this product by VeloChampion, contact us by completing and submitting the form below. If you are looking for a specif part number, please include it with your message.